I started up this game of Assassin’s Creed IV: Black Flag, and I felt unsure. I was unsure of how this game would be after a four year hiatus from the Assassin’s Creed franchise. Would I get the same product I got time and time again from this franchise: a slightly different “cool” hooded protagonist with slightly different weapons in a slightly different plot loosely grounded in somewhat historically accurate characters? Probably. I knew what I would get when I played this game; this is a series whose successes are built on slight tweaks of a recycled formula. However, the location and characters would be brand new for me to free run tall buildings, assassinate nameless guards, and take in the virtual views of an old famous city. In a way, each Assassin’s Creed game is a mod of the previous one: changed visuals with mostly unchanged game mechanics. 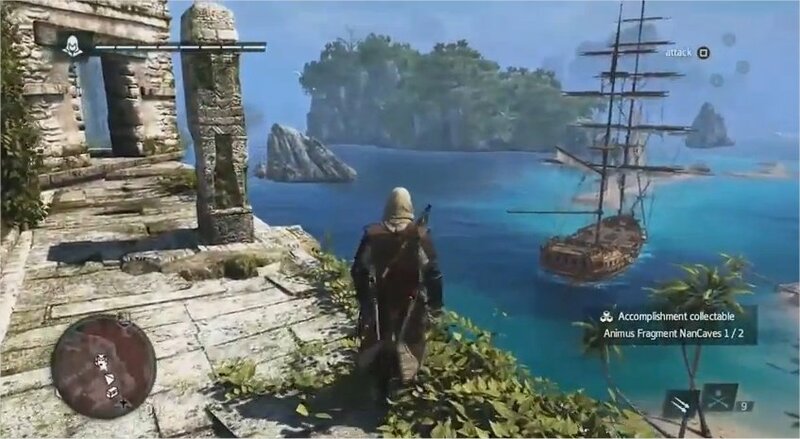 Though with Assassin’s Creed IV: Black Flag, the game doesn’t immediately place the player in an old city or futuristic hideaway. It immediately introduces us to our protagonist, Edward Kenway, who is a pirate because he wants to be free from an oppressive class-based economy and naval structure. The designers smartly encouraged me to align with this pirate character as soon as possible. Who doesn’t want to be a rebellious pirate? Then, the game cut to a battle at sea between pirate ships. I was suddenly firing cannons at 18th century ships and steering a pirate ship. Then, the ships exploded, and I was washed up on an island chasing an assassin, who I ended up murdering. I have to commend Ubisoft for knowing what gamers want out of Black Flag: to be a pirate and assassinate people as soon as possible. However, the new pirate pleasures do not really justify passing this game off as anything new. This begs the question of why these games keep getting made and bought? Why do people basically want a nicer version of a game they already have? I suppose it makes sense for players new to the franchise to play this game, but if I already have Assassin’s Creed II and Assassin’s Creed III, why do I need this game? Why don’t I just play those games again if I really want to instead of shilling another $60 to Ubisoft? Ultimately, I was unsure about playing Assassin’s Creed IV: Black Flag because I had hope amidst my cynicism. I had hope that this game could be potentially something different and interesting, especially after the series abandoned Desmond Miles’s weird alien-unveiling story arc. My hope was not really met; instead, I got the same game but with pirates. Don’t get me wrong, Caribbean pirates are awesome. Yet, even that different style choice is not new or fresh. It’s a safe bet on what the popular conscience deems cool. Which is all this game series will ever be: a series of safe bets siphoning ideas from popular culture and movies, inhibiting what could be a one-of-a-kind game experience. Cloud_imperium. “Assassin’s Creed IV: Black Flag Review; ARRR !! !” Gamespot, 31 Jul. 2014, http://www.gamespot.com/assassins-creed-iv-black-flag/user-reviews/2200-12602699/. Accessed 22 Nov. 2016. “Featured Video.” Disney, http://pirates.disney.com/. Accessed 22 Nov. 2016. “Screen 621262.” Assassin’s Creed III Gallery, gamershell.com, 8 Apr. 2012,http://www.gamershell.com/ps3/assassin_s_creed_iii/screenshots.html?id=621262. Accessed 22 Nov. 2016. Usher, William. “Assassin’s Creed 4 PS4 Gameplay Trailer Seeks Out Hidden Treasure.” CinemaBlend, 2013, http://www.cinemablend.com/games/Assassin-Creed-4-PS4-Gameplay-Trailer-Seeks-Out-Hidden-Treasure-57742.html. Accessed 22 Nov. 2016.